Seamless continuous grain finish (Shown left) not available with most stainless steel manufacturers. Other manufactures are only capable of finishing with a miter corner (shown right). Prevents bacteria build up in medical and food processing areas. Sloped profiles are beneficial for wash down areas to help with runoff. With this Profile, you’ll eliminate water and/or chemical build up. 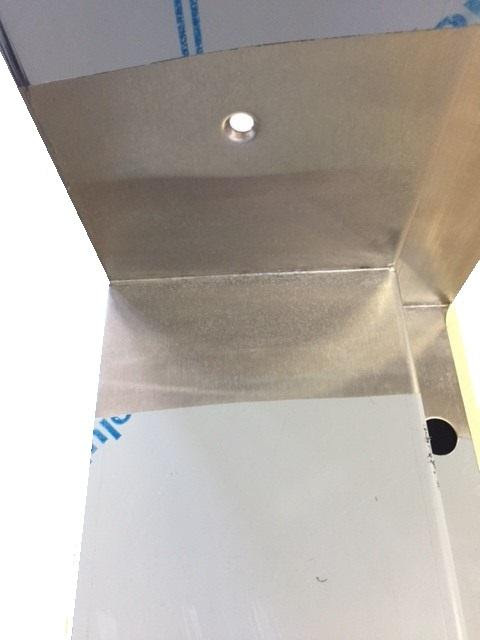 Seamless welded top and/or bottom channel (accompanied by seamless welded vertical edges) gives a full seal to the door to aid in preventing bacteria build up in wash down facilities, food processing & dairy factories. 304 Stainless has approximately 18% chromium and 8% nickel. These elements give stainless the ability to resist rusting. 316 Stainless adds 2% more nickel and 2% molybdenum. Molybdenum gives 316 steel the benefit of resistance against damage by chloride and other powerful corrosives. 304 steel can pit in these environments, but 316 will not. Particularly in door and frame installations outdoors, in pharmaceutical processing areas, and near pools and the ocean, 316 stainless has the potential to last many more years, saving money in the long run. 316 allows for a higher resistance to corrosion, which keeps the door and frame standing longer than the building. Be Sure to Check Out Our Upcoming Case Study in the October 1st Issue of the DHI Magazine! In the issue, you’ll get to learn about the custom doors we manufacture for Quicken Loans headquarters and several of their other locations.